Tributes have come pouring in for a ‘giant of the showground world’ who has died at the age of 89. John Murphy was well known throughout the region and nationally as a leading member of the show world. John Murphy working on his beloved walzer. Big John, as he was known to his family, was the fourth generation of showmen, taking his fairground across the country. John, who sadly passed away on Monday following a short-stay in South Tyneside Hospital, was well-loved in Hartlepool where his family had run the fairground at the Headland for almost 100 years, as well as other big events including Houghton Feast, Durham Miners’ Gala and The Hoppings at Newcastle. John had lived in South Shields for more than 60 years. John’s grandson, John Henry Murphy, said the family had been overwhelmed by the hundreds of lovely comments and messages of sympathy the family has had since his grandfather’s death. The 33-year-old, who helps run the family business, Murphy’s Funfairs said that, despite retirement, his grandfather remained the boss. John Henry said of his grandfather’s passion for the business: “It wasn’t just a job to him, it was a way of life. In the show world you couldn’t get anyone bigger, but he worked very hard for it and had done since the age of 15. “He was still driving lorries up until about 10 years ago. One of the first photographs of the Murphy's Funfair walzer. 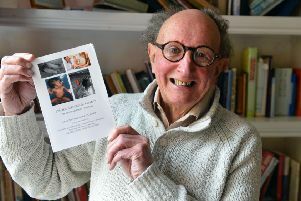 John, who was born in the back of a show wagon, was married to Alice, who sadly died three years ago aged 84, and had two children, John and Alison, four grandchildren and two great-grandchildren. His son, known as Little John, 64, said his dad had certainly had an accident prone life, he lost his right eye when he was 12 in an air rifle accident, then at the age of 20 he slipped and went into a fairground generator, losing his right arm. Then in his 40s, John was struck on the head by a crane and ended up with a metal plate in his head. John Murphy's Proud Peacocks steam engine. John said his dad was an inspiration for the way he overcame his disabilities to run the business, saying: “He was such a determined man, he did everything anyone else could do. He drove a specially adapted HGV and was still working at the fairground well into his 70s. In the early 1900’s Murphy’s Funfairs had two steam traction engines, which were later bought and restored and the family is hoping one of them will come back to South Shields for the day of John’s funeral, which will take place on February 11, at 2.45pm at South Shields Crematorium.